JT’s annual ‘Books-for-Tablets’ campaign launches shortly, with primary school pupils all over Jersey being encouraged to collect old telephone directories to recycle them, in exchange for FREE tablets for their school. Every year this campaign aims to encourage islanders to help reduce waste. But also to teach children about the importance of recycling by getting involved. For every 150 directories a school collects, JT donates a pupil-friendly, touch-screen tablet to help students access the internet. As well as for use for educational apps in a safe and secure environment. Last year a record, 25 local primary schools took part in the campaign. They collected over 8,000 directories, securing over 50 FREE tablets between them. Winner, St Peter’s Primary School collected staggering 1,425 directories. So, they received nine new tablets from JT. In second place, St Lawrence Primary School collected 680 books in exchange for four tablets. Finally, with St Christopher’s Preparatory School a close third, having collected 608 directories and also receiving four tablets. New for 2018, the school that collects the most directories will also be taken on a tour of Lodge Farm in St Saviour. Pupils will learn about the dairy industry as well as how JT is helping farmers to introduce digital technology. The prize was chosen to align with the new 2018/2019 directory featuring Roseland Roy Boy Tulip on the cover, a cow who lives on a ‘smart’ farm in Jersey. 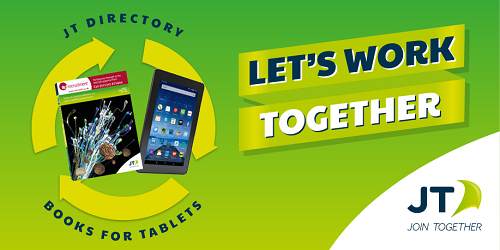 The JT Books-for-Tablets competition runs from 16 April to 25 May. Schools that are interested in taking part or would like more information should contact Natasha Marriott on 01534 882336 or email Natasha.Marriott@jtglobal.com.